Reflecting on my exchange year in Indonesia, I would have to say that the highlight so far has been my trip to my host father’s village. It was my first experience of rural, tribal Indonesian culture, and it was also the week I became an official member of the “Harahap” family. We arrived to my father’s host village on a Saturday morning, and most of that day was spent setting up for the wedding that would occur the next day. 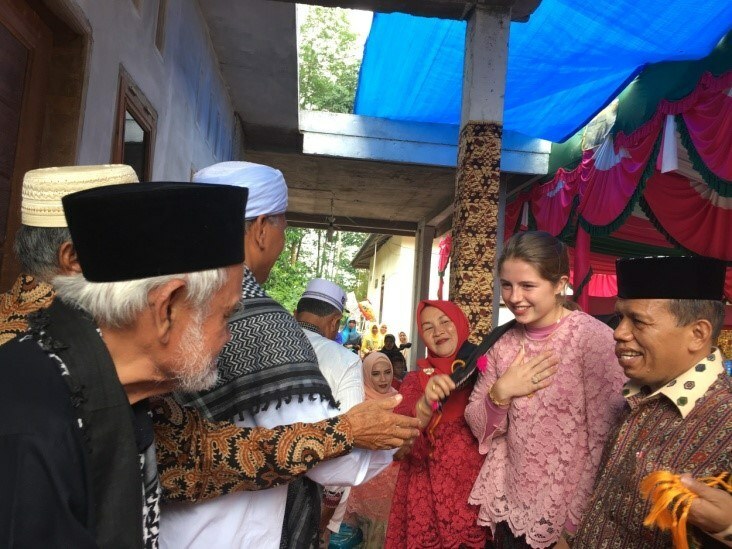 This trip was in September, so my Bahasa Indonesia language skills were still developing, and my ability to speak the local dialect of Bataknese was non-existent, but that didn’t stop the many old women and excited teenage girls helping set up from trying to talk to me or teach me both languages. The wedding on Sunday was colorful and my first experience of a true Batak Mandailing event (an event from my host father’s cultural group). The clothing and traditions were exciting and overwhelming all at the same time. What I thought was amazing was that everyone in the village played some part in helping cook or set up the entire event - everyone in my host father’s village is from the Harahap family, and family always supports family here in Indonesia. Behind the house where the wedding was taking place, there were over a hundred people gathered around large metal pans cooking rendang (a spicy meat dish) and other traditional Bataknese foods. They were nothing but enthusiastic to show me how to wrap the rice and cook the rendang – and take a few photos in the process, too! Following the day of the wedding was the name-giving event for my host nephew. I was very excited for the event, as it was the first time I would be wearing the traditional songket and kebaya clothing, and it wasn’t until the night before that I was told I would be joining the event and receiving my official Batak Mandailing name. “Siti Asih Harahap” – that is what I’m known as in the village now. It was the first of many times that I felt like my host family really tried to make me feel like I was their actual family. Technically speaking, they actually did make me family through this event and went through all of the traditions that they would for anyone else. Now, wherever we go, I proudly introduce myself as Asih Harahap.